Offensive cover art, throat ripping vocal atrocities, bone powdering riffs, nail pounding rhythms and surprisingly proficient melodies are the hallmark of many great death metal bands and few more so than ADVERSARY. 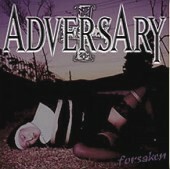 "Forsaken..." is, I believe, their debut offering and belies the relative inexperience of the band. Consisting of members well versed in the underground ADVERSARY show they have enough faith in their music to let it speak for itself. No dim-witted attempts at being the fastest or heaviest or most evil or sickest or rawest. No "est" of any kind. Just moderately paced, well constructed and melody rich death metal. The only thing this CD lacked was biog budget production and non-cheesy artwork. Somehow I don't think those are flaws most death metal fiends are going to mind.